It is time for some electric/acoustic action with John Butler. I will attempt to approach his tone using some common and relatively inexpensive pedals. 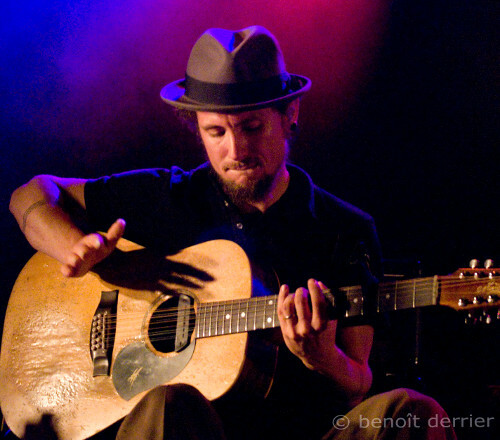 Australian guitarist John Butler was revealed to the mainstream in 2004 when his third album, “Sunrise Over Sea”, was released. This album included a huge hit single: “Zebra“. John Butler always plays in a trio configuration, hence the name of his band “The John Butler Trio”. His guitar style and and use of gear are quite original, although not entirely unique. His main instrument is a 12 string acoustic guitar made in Australia by Maton. I should actually say 11 strings since the higher ‘G’ is removed as, according to John Butler, it makes the guitar sound too trebly. This guitar is used “normally” as well as plugged into effect pedals and a Marshall amp to give it a more “electric” vibe. From a style point of view, John Butler’s mastery of finger picking and slide as well as guitar percussion make him an interesting guitarist to study, quite fresh compared to the heavy rock super fast arpeggios type. Don’t get me wrong, I like super fast heavy metal players but it is sometimes nice to study a different style, which happens to be quite technical too! John Butler also plays a Dobro, a banjo, a Telecaster or a 6 string acoustic guitar but I will concentrate in this post on his 12 string tone. In this interview, John Butler explains in details what guitar he uses and his signal path, which is fairly complex but I will try to summarise it here. John Butler’s 12 string Maton is fitted with two pickup systems, one for the “electric” tone and one for the “acoustic” tone. John Butler uses the same system live or in the studio. In the latter case, his guitar is also recorded by microphones which gives him another signal to play with. This whole system is very flexible as it can provide a pure acoustic tone, an acoustic tone with effects or a more electric tone. 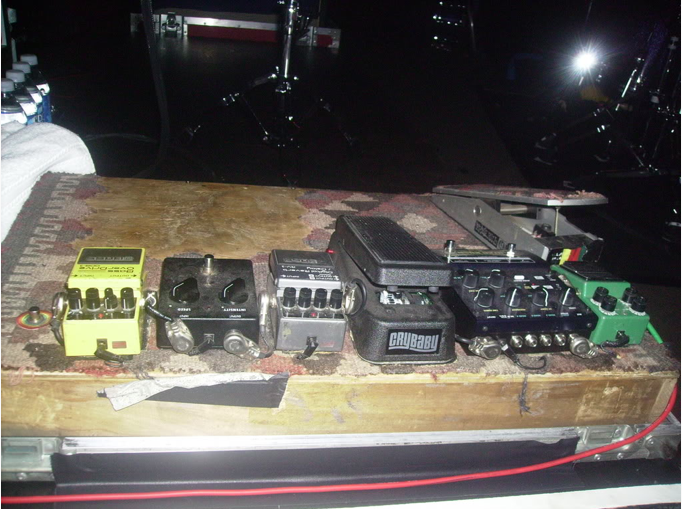 The amount of electric tone can be controlled via a volume pedal. The idea in this series of posts is to try to capture the spirit of one’s tone with a minimum of gear. I hope to inspire you into using an acoustic guitar in an “unconventional” way, that is augmented by an electric guitar amp and effects. I have not tried to reproduce the acoustic/electric duality of John Butler’s setup and have focused on the electrification of an acoustic guitar. It is something than few guitarists do but which can open a world of possibilities. I am lucky enough to own an Australian made Maton guitar, an EM225C to be precise. It is equipped with the AP4 pickup system, also designed by Maton. It is a fantastic instrument but has “only” 6 strings. So the first pedal I decided to use was a BOSS CH-1 chorus in order to simulate a 12 string tone. I then decided to use a BOSS RV-3 reverb, close enough to the RV-2 John Butler uses. Both the RV-2 and RV-3 are discontinued so you will either have to get the newer RV-5 or look on the second hand market. I also decided to use a BOSS SD-1 overdrive which is a cheap but good enough overdrive. Of course, you could be using an Ibanez Tube Screamer or any other good overdrive, including your amp’s. Finally, I opted for a Morley wah because we all love some wah action. Maton EM225C Guitar -> Morley Wah -> BOSS SD-1 Overdrive -> BOSS CH-1 Chorus -> BOSS RV-3 Reverb -> Fender Champ amplifier set clean. Amp: 1974 Fender Champ with VOLUME at 3, BASS at 10 and Treble at 2. The amp was miked with a RODE NT-4 and recorded with a BOSS Micro-BR. The recording was then transferred into Cubase 5 to add some compression (mainly to optimise the volume). Yeah. Tha is perfect but… I need to play in live with my band, but when I add volume in te amplifer the guitar starts to whistle. If i can´t add volume i can´t practice. What can i do?? Well that’s why solid body guitars were invented in the first place. There is a number of things that can help (apart from jut going away from the speakers): using an equalizer to pin point the offending frequency(-ies) and eliminate it(them) or use a feedback eliminator such as the one integrated into the . You can also try to plug the hole of your guitar, there are cheap-ish accessories for that. Do you mean guitartoneoverload.com looks weird on an iphone 4? I find it looks OK although you have to double tap on the text to make it more readable. Granted, it is not a fully mobile enabled site and I am thinking about making it so, but it just hasn’t had a high priority until now. I doubt it, the idea is to use an electric guitar amp with an acoustic guitar. Many thanks for the great post, I was looking for details such as this, visiting check out the various other articles. I did try to approach John Butler’s tone also. But I fell. Now I know why. Thanks for sharing. Very good post! Does anyone knows the tuning of this 11-string guitar?and what about this capo he use in “ocean” is already low tuned… help me! Please try to emulate John Butler’s “Ocean” with a six string guitar and let me know what happens. I was also thinking about using the marshal as100d as my amp and planning on running that same combination of pedals + a distortion to give it a little extra. the amp has a built in feedback eliminator… if you dont recommend that amp for this sound what amp would you recommend that would also have the versatility to play clean acoustic guitar? Just wanting to know what John uses for the kick sound on track “Ocean” ? ?